Yay for sleeping in! Since we didn’t have to leave the hotel until 11am, Jill and I slept in. 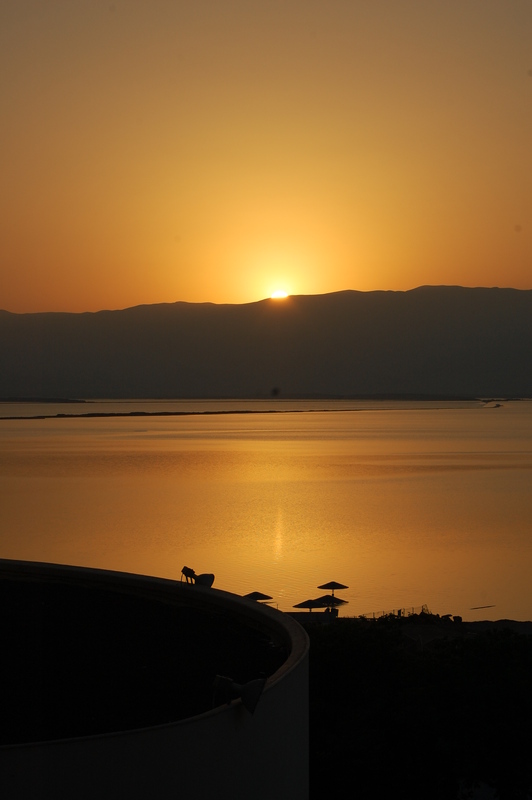 We had intended on watching the sunrise over the Dead Sea from our hotel room… but we missed it by about 15 minutes. A bit disappointing, but I got to see pictures of it from others. It was nice, however, to take our time getting ready and repack our suitcases. My suitcase had gotten fairly disorganized by this point, so it was nice to make sure everything was in its proper place and to keep dirty clothes from fraternizing with the clean ones. Our first morning in Israel… and actually alert, I might add. Amazing what sleeping horizontally can do for a person! And our first stop was not disappointing. 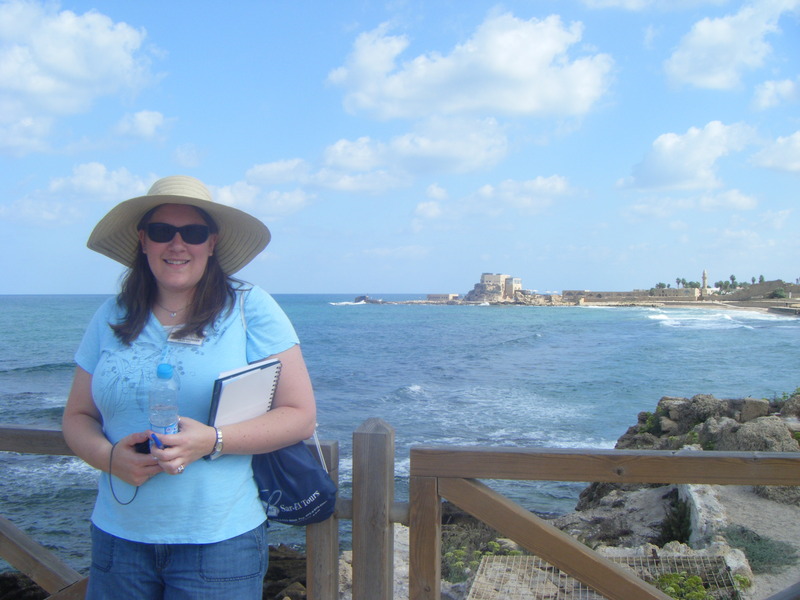 We headed north a few miles to Caesarea. It was built by Herod the Great (or Not-So-Great, depending on who you ask) as a tribute to Rome for being chosen as a king. He built an entire Roman city there, complete with a man-made harbor (see picture). Now, this was kind of a big deal since there were no other harbors along the entire coast of Israel. But of course he saved the best for himself and built a 3-story palace, complete with his own private swimming pool. 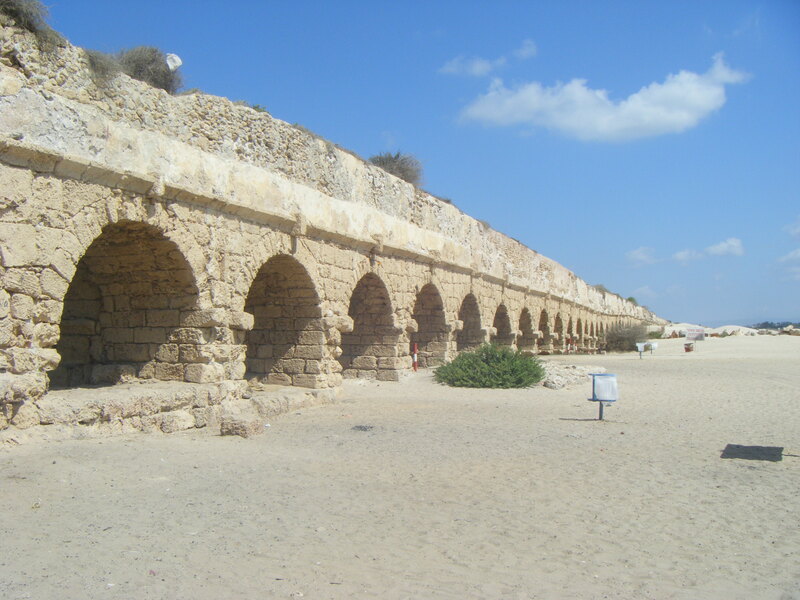 Because of Caesarea’s location, there was also the problem of available fresh water. So, Herod, being the brilliant man he was, created aqueducts to carry fresh water into the city (see below). Our next stop was at Mount Carmel. This is where Elijah took on the hundreds of prophets of Baal, and God delivered in a huge way. The story goes that for hundreds of years after this encounter, people still called it “The Place of Burning”, because they could still see scorch marks on the rocks from fire. I looked around for some scorched-looking rocks, but I was unsuccessful. 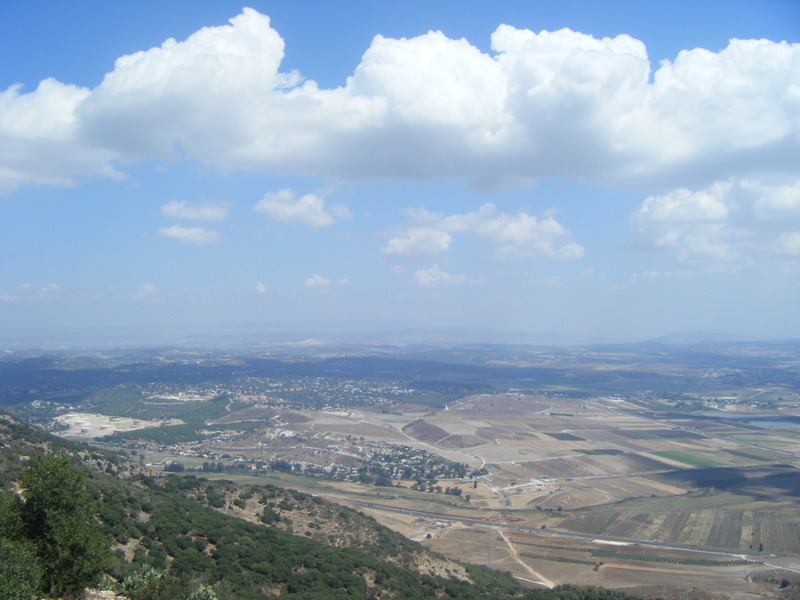 From on top of the observatory area, you can see the entire Jezreel Valley (pictured below). So many things have happened in this valley, but I think what I think is so interesting is that its history is not done yet. That’s right, Armageddon will be taking place in that very valley. In fact, the word Armageddon comes from the Hebrew “Har Megiddo”, which means “hill of Megiddo”… which, coincidentally is where we went next, after our first lunch of falafels and Jesus-Coke-cans (see my facebook page for further explanation). Megiddo is a mountain, but it is man-made. Man has been building on that site for so long, that it has created a mountain. It is likely that Abraham visited this site on his journeys, because Megiddo dates back to before him as a Canaanite city, plus it has a natural spring, which makes it a likely stopping place for any travelers. We also know that Solomon built here. He had stables, silos, a cistern, and a defense post on this mountain. From it’s height, it makes it a great defense, because you can see anyone coming across the valley. And Megiddo will once again be important in those final days as a defense post. Our final stop of the day was in Nazareth where we visited a recreated village from Jesus’ time. Our guide through the village was actually a nice Canadian woman, so it was refreshing to listen to a much subtler accent. She took us through the village and showed us what life in that time would have been like. We met a shepherd and his flock of sheep and goats, we met “Joseph” in his workshop, and his sister “Hannah” who was spinning wool and weaving. We saw an original wine press that was on the grounds, as well as an olive press. They also reconstructed a first century synagogue, and I had the privilege of reading Luke 4:16-30 to everyone. It was really interesting since it was the most historical-looking place we visited – almost everywhere else has a church built on it, so you lose some of the originality of the place. When we left Nazareth, we drove through the city of Cana (where Jesus turned water into wine), and we could see Mount Tabor in the distance. But finally we got to the Sea of Galilee and our hotel, which was on the very southern part of the Sea. What a fabulous hotel. All of our rooms had a view of the Sea, and they had peacocks running around the grounds. It was so beautiful and peaceful there! Stay tuned for the next installment of tales from Israel!